Takashi Mochizuki recently published an article that Sony has once again cut their sales targets for mobile devices, which was a prudent move for Sony given the global competition they face. But hold in there, they aren’t dead yet. Our analysis shows that Sony has actually gained Mindshare in Q3 2014, just not at a rate to move the needle on quarterly expectations. Sony still lags behind all other handset brands in terms of buzz volume, but saw a spike in Net Promoter Score. This means that while their products are not widely discussed, the few consumers reviewing them are delighted. Motorola experienced a similar resurgence thanks to the Moto G and Moto X. The increasing delight surrounding Sony and Motorola show that consumers do not need the prestige that comes with an iPhone of Galaxy smartphone; in fact, they are enjoying less popular handsets more. 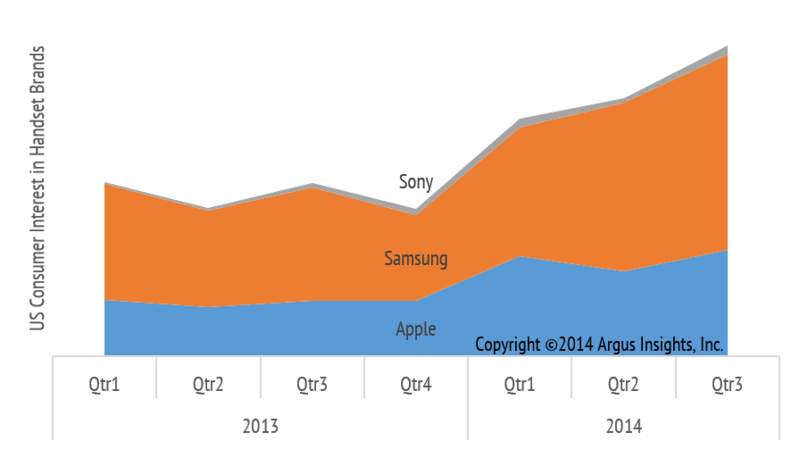 Pitting Sony against smartphone giants Apple and Samsung in terms of consumer interest paints a grim picture. However, if we measure Sony against themselves, it is clear that their mindshare is growing. The thin grey line above the giant block that is Samsung represents consumer interest by way of review volume for Sony Smartphones over the past 2 years. This line is slowly but surely growing thicker as Sony is commanding more interest. While Sony is clearly not as popular as Apple and Samsung, they are seeing a different type of growth. People cannot stop talking about iPhones and Galaxy phones in general, but consumers cannot stop saying good things about Sony smartphones. It is one thing to be popular, but a few delighted allies can go a long way. 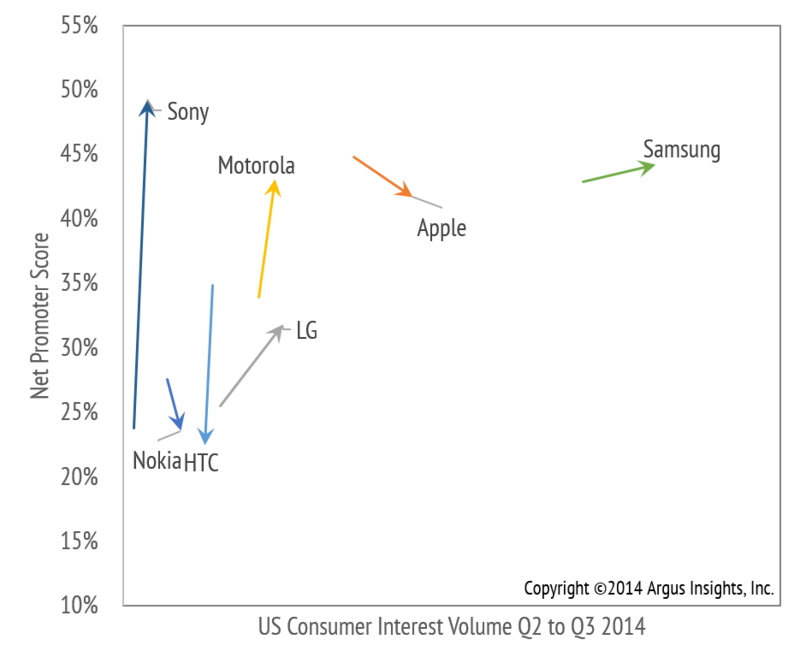 We will continue to track Sony’s progress along with consumer perceptions of Motorola, Apple, Samsung, and others. Please contact Argus Insights if you would like more specific information regarding any smartphone brands or products, or information about any other sectors we cover. If you want more information about the market as a whole, you can order our Monthly Smartphone Report or sign up for our free Weekly Newsletter. Let us tell you how to make consumers happy to make your business even happier.